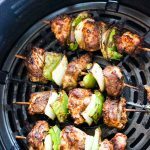 Juicy and soft air fryer beef skewers are so easy to make- with steak, with stew meat or ribs! Marinating for a at least 30 minutes makes this dish so full of flavor. Thread beef, onions and bell peppers onto skewers. Add some freshly gound black pepper. Cook in preheated to 400F Air fryer for 10 minutes, turning half way.